Eber, Dorothy Harley. "Pitseolak Ashoona". The Canadian Encyclopedia, 09 November 2016, Historica Canada. https://www.thecanadianencyclopedia.ca/en/article/pitseolak-ashoona. Accessed 18 April 2019. Pitseolak Ashoona She is known for her lively prints and drawings, which show "the things we did long ago before there were many white men" and for her imaginative renderings of spirits and monsters. Pitseolak Ashoona (1904\u201383). Photograph by Norman Hallendy, 1968. Image: DINA/CD 24PR68 37/\u00a9 Dorset Fine Arts. Printed by Iyola Kingwatsiak. \r\nImage: DINA/CD 24PR60 51/\u00a9 Dorset Fine Arts. Pitseolak Ashoona, CM, artist (born between 1904 and 1908 on Nottingham Island (Tujajuak), NWT; died 28 May 1983 in Cape Dorset, NWT). Among the first generation of Inuit printmakers, Pitseolak Ashoona was born en route from Nunavik in arctic Québec to the south coast of Baffin Island (Qikagtaaluk). She is known for her lively prints and drawings, which show "the things we did long ago before there were many white men" and for her imaginative renderings of spirits and monsters. Pitseolak Ashoona grew up on the land in the traditional semi-nomadic lifestyle. During her childhood, Pitseolak’s family travelled along the coast of Baffin Island, providing her with a deep and intimate knowledge of the landscape, which would later be reflected in her drawings. In 1913, Pitseolak’s family joined other family members in camps in and around the Foxe Peninsula. In the same year, the Hudson’s Bay Company established a post in what would eventually become Cape Dorset. During the winter of 1921–22, Pitseolak’s father Ottochie died. After the death of her father, Pitseolak’s uncle Kavavow arranged for her to marry Ashoona, a respected hunter. They married in a Christian ceremony in Cape Dorset in 1922 or 1923. Pitseolak and Ashoona moved between camps up to 10 times per year, including remote inland areas such as Lake Netsilik. Over the course of their marriage, Pitseolak gave birth to 17 children, only six of whom she raised through to adulthood; some died in childhood, while others were adopted into other families in the community as was the custom in Inuit communities. Their sons Kumwartok,Qaqaq and Kiawak Ashoona and daughter Napachie Pootoogook also became artists. Pitseolak’s granddaughters Shuvinai Ashoona and Annie Pootoogook are both regarded as significant contemporary artists. Following the death of her husband Ashoona, in the early to mid-1940s, Pitseolak moved to Cape Dorset to be close to family members only to find that they had either died or moved away. Several years of considerable hardship ensued. The difficulty of this period was made worse by the fact that it coincided with the Second World War, a period of decline in the demand for furs. It was difficult for Pitseolak and the community to provide for her and her six children, and during these years, before her sons grew old enough to become hunters and married, there were periods of hunger. Typically, an Inuit widow would quickly remarry, and it was unusual, and a sign of her independence, that Pitseolak did not do so. The opportunity to become an artist came about as a result of the Cape Dorset arts and crafts program initiated by the then Department of Northern Affairs and National Resources (now Indigenous and Northern Affairs). The program was designed to help Inuit make the transition from subsistence hunting and trapping to the wage economy of settled communities. 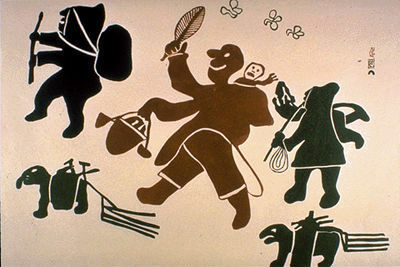 The Cape Dorset program was spearheaded by the artist James Houston and his wife Alma Houston. Although the Inuit had carved and decorated fabric and other items for centuries, there was no precedent for drawing images on paper or printmaking or for the distinctive role of the artist in the community. While James oversaw drawing, printmaking and sculpture, Alma focused on the traditional skills of women in order to explore the possibilities of hand-sewn goods. 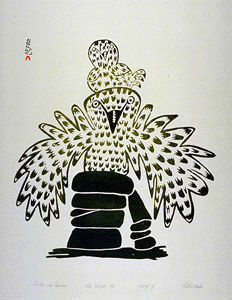 Pitseolak worked with Alma on finely decorated parkas and mittens for two years, but after seeing the prints and drawings and prints of her elder cousin Kiakshuk, she decided to try drawing. In addition, since she was able to take her first drawings made on small sheets of paper to the West Baffin Eskimo Co-operative and received much needed money for them, she was encouraged to continue. James Houston also offered encouragement, as did Terrence Ryan, who replaced Houston in the early 1960s. For Pitseolak, the 1960s were the period during which she learned to draw, mastered her craft, and developed the distinctive style and set of themes she would explore for the rest of her life. 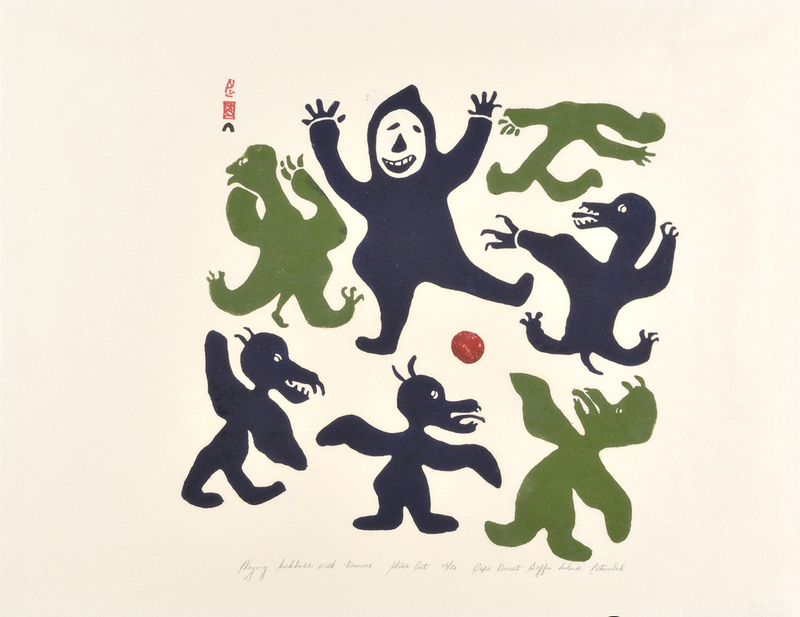 From the beginning, Pitseolak’s work depicted both the ordinary lives of the Inuit and their traditions. Tattooed Woman (1960), for instance, is a frontal portrait of a woman wearing a traditional woman’s parka, an amutui, with an extended hood in the back that can be used to carry children; her facial tattoos are depicted as dense vertical arches extended down on her chin and curving wing-like lines across her cheeks. In 1963, the drawing was made into a stonecut print by Lukta Qiastuk. 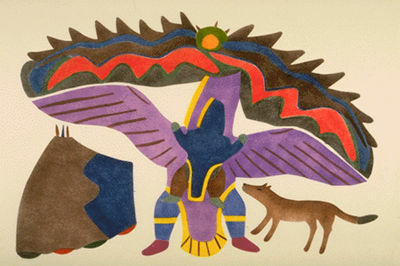 Untitled (Birds Flying Overhead (1966–67), rendered in colour with felt tip pens, has a woman on the ground with a baby on her back reaching up toward huge birds flocking up into the sky. 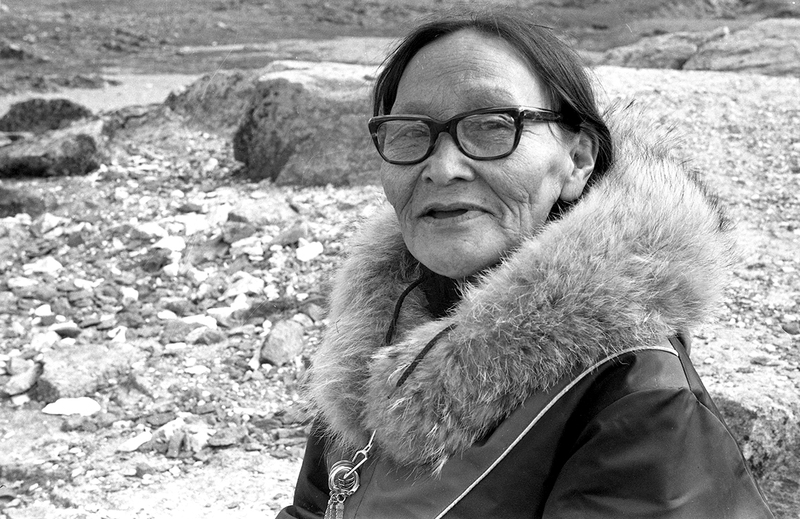 The 1970s was a productive period of Pitseolak, which brought her wide recognition and success. In 1971, she published Pictures Out of My Life, an edited transcription of interviews conducted by Dorothy Harley Eber interwoven with drawings. The book was published in English and Inuktitut. In 1973, Pictures Out of My Life was adapted for film by the National Film Board. It premiered at the National Arts Centre in Ottawa that year, along with the unveiling of a wall hanging by the Inuit artist Jessie Oonark. Pitseolak’s later work is characterized by its exuberance, joyfulness and humour, as well as by its attention to detail. Summer Camp Scene (1974) depicts two visitors waiting in the folds of hills, on top of which is a spotted owl and a hunter on the lookout for prey, flanked by two birds. Below, two women relax in their tent, while children play with stones and a man fixes his sledge. For all the hardships of Inuit life Pitseolak had personally experienced, Summer Camp Scene depicts a relaxed summer afternoon. The Shaman’s Wife (1980), on the other hand, is strange, otherworldly and a little frightening. Arms folded, legs crossed, her face is spotted with tattoos and her eyes are rolled back as though in a trance; on her head is a bird with a twig in its mouth, representing the shaman’s spirit helper. Pitseolak converted to Christianity early on, and would have had little knowledge of or experience with shamans apart from stories told to her by her parents, but in The Shaman’s Wife she depicts an aspect of Inuit culture that has to a significant extent vanished. In 1974, Pitseolak was inducted into the Royal Academy of Arts. In 1976, the Department of Indian Affairs and Northern Development organized a retrospective of her drawings from 1962 to 1974 that toured multiple locations in Canada and the United States, including the National Gallery of Canada and the Smithsonian Institution in Washington, DC. In 1977, she was inducted into the Order of Canada.